Nate Stucky, director of the Farminary, checks a rain gauge at the farm owned by Princeton Theological Seminary. 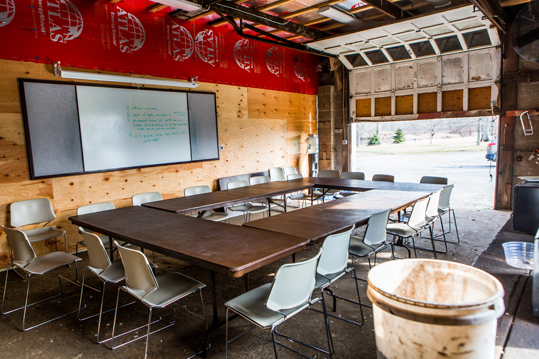 Students at Princeton Theological Seminary engage in physical and intellectual labor at the Farminary, where they learn about the interconnectedness of life and death. A pile of potatoes sits on the ground next to mounds of decomposing leaves at a 21-acre New Jersey farm. Nearby, a humble fence surrounds a greenhouse and several rows of compost-enriched soil. It’s a cold day -- a record-breaking snowstorm is bearing down on the East Coast -- and the winter landscape is bleak. But the potatoes, donated by a local food bank, are doing their work. As they rot, they are helping revive the nutrient-hungry earth. This corner of the farm, which is owned by Princeton Theological Seminary, offers a concise lesson for the students who come here for theological education. The core principles are all on display: birth, growth, decay. And the death that precedes new life. 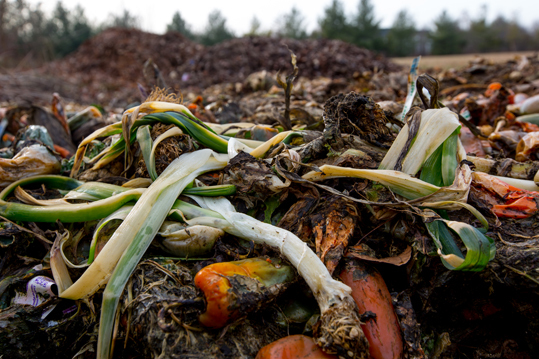 Inedible produce becomes compost, which is used to grow more food. Now in its second year of operation, the Farminary is both the setting and the subject of a new experiment in theological education spearheaded by Nate Stucky, the project’s director. 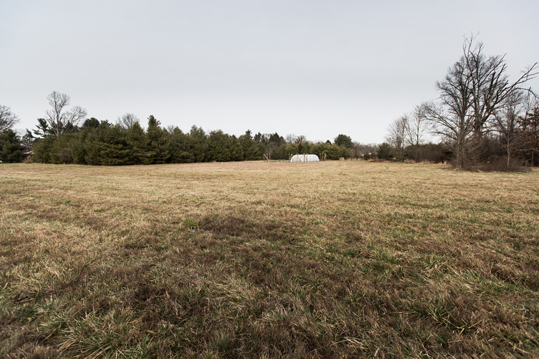 Soon, a second cohort of students will join in study at the Farminary, where they’ll learn through physical labor as well as scholarly endeavor, and will experience first-hand the intimate interconnectedness of life and death. Stucky was born and raised on his Mennonite family’s farm in central Kansas, and worked on commercial farms in his high school years. After college, he spent six years as a youth minister and then returned to farming for two years before being called back to ministry. Nate Stucky checks on the beds inside the greenhouse at the Farminary. He began to wonder if farming and ministry could be combined while working on his master’s degree. As he finished his Ph.D. at PTS, he began considering how agrarian thought and practice might help him rethink Christian education. With the encouragement of his mentor, Mark DeVries, he began creating a new course for the seminary focused on Scripture and food. Are there aspects of your life and history that you might integrate into your ministry? That’s when the project “benefitted from the kind of coming together of resources that can only happen by grace,” said Kenda Creasy Dean, a PTS professor of youth, church and culture. It turned out that the seminary owned a farm -- a property not far from campus. 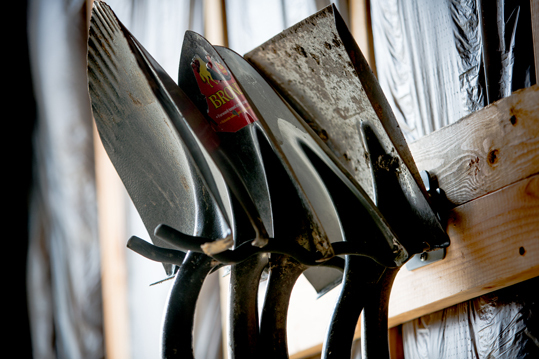 When the seminary acquired it in 2010, the administration saw the investment potential and thought the space might be useful for equipment storage. No one imagined it would be used for educational purposes. For several years, the property was under lease to a tree farmer, but the lease was coming to an end. So with the endorsement of the seminary president and the guidance of a broad-based steering committee, Stucky began planning for the Farminary. The winter landscape is the perfect setting to learn about death and resurrection. Committee member Jaqueline Lapsley, a PTS associate professor of Old Testament, is among the project’s enthusiastic supporters. “In general, I think there’s an enormous amount of interest in the integration of the head and the rest of ourselves, acknowledging more fully the ways in which our persons participate in our learning, not just our intellectual engagement,” she said. In planning, he struggled with practical concerns -- it was more like preparing for a mission trip than for a class -- but also pedagogical ones. Working the soil needed to be integral to the broader purposes of the course, he determined. He wanted to help the students think about the environment, climate change, food justice and sustainability. But he also wanted to do more. By having students literally get their hands dirty, he wanted to help them bridge the Enlightenment divide between body and soul. The project’s main goal is to form leaders in a particular way, to cultivate within them agrarian sensibilities like paying attention to seasons, understanding the interconnectedness of life and death, and becoming comfortable with failure, Stucky said. What can the church learn from the practices of farming? He also figured that digging in a compost pile would offer one of the fastest paths from a hipster idealist mindset to a more nuanced version of the agricultural life. 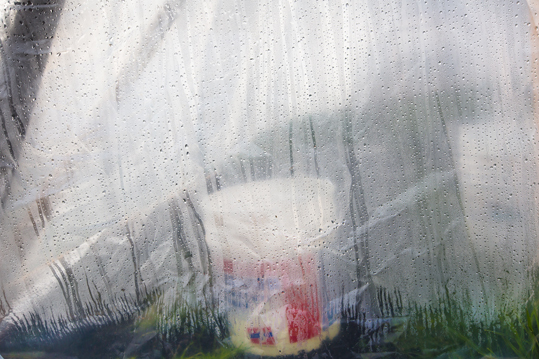 The practical challenges were real: how do you teach at a farm in the winter? There is an enclosed space for meeting, but it’s very rough, and very cold. He settled on meeting later in the semester in six six-hour blocks. Students learn in this rough classroom as well as out in the fields and greenhouse. Sessions followed a common structure: an hour-long small group discussion of assigned readings, then two hours of work in the garden, followed by a potluck meal and two hours of traditional classroom time. The agrarian work flowed seamlessly into the spiritual and the academic. The students built a deer fence, hauled compost and turned the soil by hand with shovels. On Maundy Thursday, they washed each other’s feet. They discussed agrarian texts. And they examined how all those experiences influenced their thoughts about teaching the Bible in congregations. Nick Babladelis, a student in that first class who is now a teacher and environmental steward at St. Paul’s School in Concord, New Hampshire, said the class was formational for him. Discussing theology over shared meals after having hauled compost into beds the students had built is very different from listening to a lecture in a classroom, he said. Despite the season there are spots of beauty on the farm. “The different approach is as much a part of the hope for changing learning as it is the specific content. There’s a methodology here that extends beyond the Farminary specifically, and then there’s also the specific content of ‘we think it matters that Christians are leading and engaged on the most important ecological issues that we’re facing, and that the church needs to face alongside its members,’” said Babladelis, who also serves as managing editor of the digital quarterly EcoTheo Review. Katie O’Hern, another student, now the minister for discipleship and mission at Asbury First United Methodist Church in Rochester, New York, said she didn’t expect to love the discussions of the assigned readings as much as she did. In addition to Scripture, texts for the course included Norman Wirzba’s “Food and Faith: A Theology of Eating,” works by Wendell Berry, and a memoir by Will Allen, a sharecropper’s son who started an urban farm after years in professional basketball and the corporate world. For some of the readings, Stucky had the students jot down quotes or questions on index cards, which they kept in their pockets for conversations that took place in the barn or out near the garden. In her first post-seminary ministry assignment, O’Hern said she still draws on this experience. After all, when you’re talking to people, you don’t have books in front of you. Are there opportunities to combine physical, intellectual and spiritual learning in your work? Because most of the 20 students in the inaugural class were in their last year of seminary, many of them thought deeply about how the Farminary experience would translate into their future ministry, Babladelis said. That’s precisely what the program is aiming for. “One of the things we talked about in Farminary [is that] if we teach and lead the way that we’re taught and led, then we need to model that in our seminary education in ways that will work in the church and the world,” said class member Nate Sell, who is now associate chaplain at St. Paul’s School in Brooklandville, Maryland. Sell said he learned more about some of his classmates in the first few weeks at the Farminary than he had in three years of taking regular courses with them. Students hand-turned the soil and compost as part of their spring class at the farm. The Farminary is part of a growing trend in seminaries toward programs for particular constituencies and those that focus on particular scheduling models, delivery systems or vocations, said Stephen Graham, the senior director of programs and services at The Association of Theological Schools (ATS). There have always been internships and field education, said Graham, but traditionally these activities have taken place within congregations. Now schools are seeking to fulfill their missions to reach out by serving communities that historically haven’t been well-served. They’re also searching for new ways to increase enrollment, he said. “The two go together. There are financial pressures and the need to increase enrollment, but it’s primarily driven by mission,” he said. 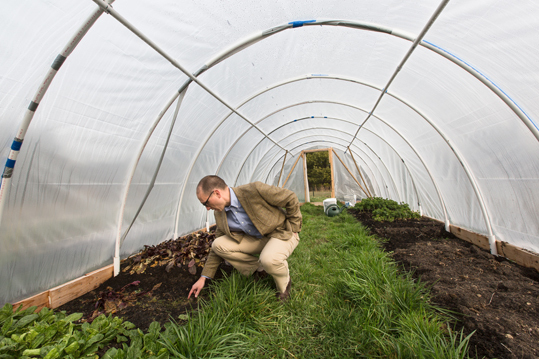 Agrarian programs have been introduced at a number of seminaries across the country, including Methodist Theological School in Ohio and Wake Forest Divinity School. In some ways, the agrarian focus parallels work that some schools are doing in urban settings, capitalizing on cities as places where people are gathered and the needs are great, Graham said. Even in winter, there are signs of new life. For Stucky, the Farminary’s emphasis on formation differentiates it somewhat from other programs. Getting theological education out into the field also helps rescue it from industrial models of education and provides a more holistic way of educating future clergy, said Dean, who is planning to co-teach a course with Stucky. 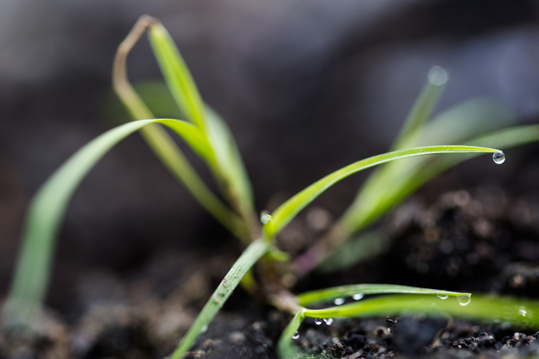 How do the practices of caring for the earth deepen our experience of life, death and resurrection? She points to other potential benefits as well, such as community building. That’s already happening in some ways. The Mercer Street Friends Food Bank, which donated the rotting potatoes, for example, had been paying to get rid of spoiled produce. 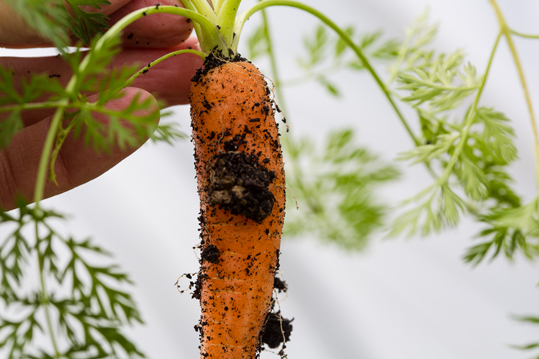 This partnership saves the organization money and puts food back into the ecological cycle. Through the Farminary project, relationships have been forged and re-imagined, Dean said. Students have bonded over meals and mulch; even the steering committee has brought together a disparate group, from faculty to administration to facilities management -- the only committee at PTS with members from all corners of the institution. And it has changed the student/teacher dynamic, Lapsley said, especially since some of the students in a class she taught at the farm knew more about farming than she did. “You’re out, totally removed from your regular classroom environment. That was so terrific, just to be together working on this very physical, very practical kind of project in which I also know very little,” she said. As the second “Scripture and Food” course gets underway this semester, the Farminary must become once again a full-fledged working farm. In order to keep its farm tax assessment, the property must produce agricultural products that contribute to the local economy, said PTS director of facilities and construction German Martinez. After years as a tree farm, the seminary now has plans to produce food and raise livestock at the farm. He envisions produce, an orchard, and possibly small livestock such as chickens and pigs. That will require a farm manager, renovations to a small cottage on the property and a lot more student labor. Fortunately, the campus is brimming with excitement about the project, Martinez said. Plans are underway to build a chapel on the property and to launch a variety of new courses. Historians, for example, could use it to teach about land reform and peasant revolts. Others imagine exploring the social and political issues of land. That includes a focus on racial justice -- an underexplored aspect of the agrarian story -- through thinkers such as James H. Cone, Stucky said. Sally Hicks contributed to this story. One student said the methodology “extends beyond the Farminary.” Could you adapt this methodology to your context? Does your organization have assets that you could put to use in new ways? Are there opportunities to combine physical, intellectual and spiritual learning in your work? What are the obstacles to doing that in your organization? Nate Stucky said that initially, it was beyond the scope of his imagination to combine farming and his call to ministry. Are there aspects of your life and history that you might integrate into your ministry?